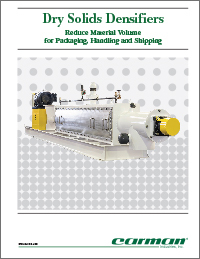 Carman Vacuum Densifiers offer an easy way to lower packaging, handling and shipping costs of fine and light powders or to deaerate these same products immediately before entry into an extruder to increase production. By removing a portion of the air that surrounds the particles, Carman Densifiers can increase the density of various products from 50% to 100%. The Densifier’s auger meters material into the vacuum chamber where a filter media, which surrounds the auger’s perforated pipe housing, permits the removal of air. The ideal product will be very fine, have an initial bulk density that’s less than 20 PCF, and have a relatively large width and length when compared to the thickness when viewed under a microscope.